The Rhodes State Office Tower is the tallest building in Columbus, Ohio. 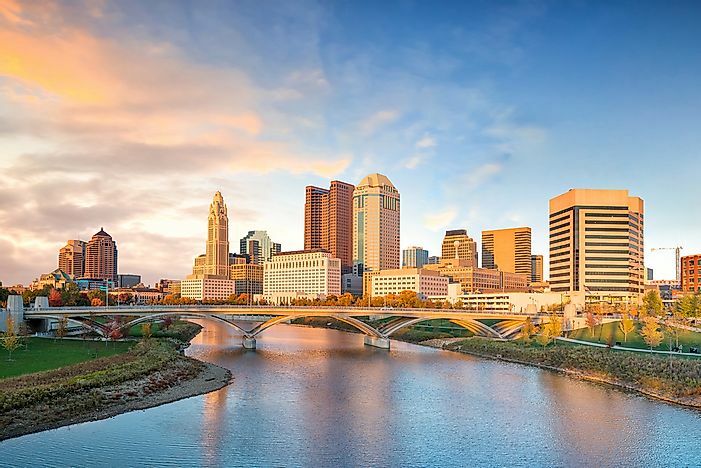 The skyline of Columbus, Ohio. The first high-rise skyscraper in Columbus, 16 East Broad Street, was completed in 1900. Its completion ushered in a construction boom which was at its peak in the 1920s. In this period, the LeVeque Tower, a 550-foot tall skyscraper was completed and was the tallest skyscraper in the city for a record 46 years. Another construction boom was experienced between 1960 and 1991. The majority of the tallest skyscrapers in the Columbus were built during this period. The next two decades were silent for the construction industry in Columbus. 2011 onwards has been a significant period of high rise development, especially in the downtown areas. The 41-story Rhodes State Office Tower is the tallest skyscraper in Columbus at 629 feet. Originally, the skyscraper was meant to be 675 feet tall. It is located at 30 East Broad Street. The construction of the Rhodes State Office Tower started in 1971 and it was completed and occupied in 1974. It is currently the fifth tallest skyscraper in the state of Ohio. The odd shape is attributed to the last-minute decision to reduce height by 46 feet. Rhodes State Office Tower has an office space of 1.2 million square feet and houses approximately 4,000 state employees. LeVeque Tower is at 50 West Broad Street and was the tallest skyscraper in Columbus for a record 46 years. It has 47 stories and is 555 feet tall. The tower was built from 1924 to 1927 and has a floor area of 353,768 square feet. The modern art skyscraper was officially opened as America Insurance Citadel. At the time of its opening, LeVeque Tower was fifth tallest in the world. It was designed by C Howard Crane and built at a cost of approximately $8.8 million. Its design and style were inspired by Byzantine architecture. William Green Building is the third-tallest skyscraper in Columbus at 530 feet. The skyscraper has 33 floors and was constructed between 1987 and 1990. It is the tallest skyscraper in the city constructed in the 1990s and the 8th tallest in Ohio. William Green Building has a lower wing extending to North Street. The wing was built on the site of Chittenden Hotel. One of the major clients of the William Green Building is the Ohio Bureau of Workers’ Compensation. Huntington Center is a Columbus’ complex skyscraper containing Huntington Center, Huntington Bank Skyscraper, Huntington Plaza, and Doubletree Hotel. The Huntington Center is the 4th tallest skyscraper in the city at 512 feet and comprises of 37 floors. It is also the tallest skyscraper in the city completed in the 1980s and is currently the 10th tallest skyscraper in the state of Ohio. In Columbus, only five buildings are at least 500-foot tall while ten are at least 400-foot tall. LeVeque Tower is the tallest building in Ohio by floor count at 47 floors. The tallest residential building in Columbus and the entire state of Ohio is the Miranova Condominium at 314 feet while Rhodes State Office is the tallest office building in the state. What Is Ohio Known For?